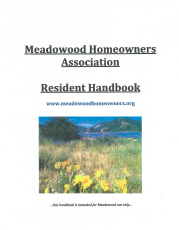 Download this Handbook for a well-organized list of rules, regulations and helpful information about why it is a pleasure to live in Meadowood. This is a regularly scheduled meeting of the Meadowood Metro and HOA Board of Directors. Regularly scheduled meeting of the Meadowood HOA and Metro Boards. The Aspen Chapel serves as the gateway to one of the most beautiful neighborhoods near Aspen. Meadowood is close to all three schools, Aspen Valley Hospital, and within walking distance of downtown Aspen. Despite this great location Meadowood feels rural, with a 36 acre meadow, cross country ski trails, a pond and tennis courts. PLEASE NOTE ! Most construction and landscaping projects require HOA Board approval. Before you start, please contact Meadowood Manager Jim Korpela with The Romero Group to see what is required in your case (Find Jim's contact info above to the left). It is very important to note that you must notify the Board and your neighbors for comment on your plans a minimum of 10 days before the meeting. Other rules and regulations: The high quality of life in Meadowood is the result of residents adhering to our rules and regulations. See "Rules and Regulations" in the HOA - Documents section of this website. Meadowood is managed by two organizations: the Meadwoood Home Owners Association (HOA), and the Meadowood Metropolitan District (MMD). This website serves both organizations. See the menu items on the left for more information about both organizations.